It captivates my senses, soothes my psyche and sparks my creativity. As the owner of The Contained Gardener, in Tucson Arizon. 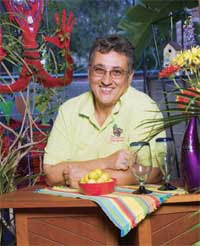 I design collections of colorful plants and flowers that, even with Tucson's desert environment, thrive in fabulous pots inside and outside of some of Tucson's most popular restaurants and also in many residences across the county. When you dine at North, Tavalino's, Jonathan’s Cork, Mimi’s Café or Roma Caffe, take some time to stop and smell those flowers. They are my contribution to what will be an amazing dining experience, tell them that I said hello!